Hargeisa,(Qaran news)- A Poet, Abdirahman Ibrahim Adam, “Abees” who holds a British nationality has been in police custody over the past week in Hargeisa. Mr. “Abees”, who is a renowned poet recently gave a reading at Mansour Hotel in Hargeisa, in which, he severely criticized the conditions at the local police stations. The poet highlighted the conditions at the local stations, in particularly the Koodbuur Division. Mr. “Abees” has not been brought before a magistrates court and was not arrested under a court warrant, but was taking from a public place by police officers. At the a recent police press conference, the Somaliland Police Force accused the poet of “using foul and abusive language” in his poem pertaining the conduct of the police force”. 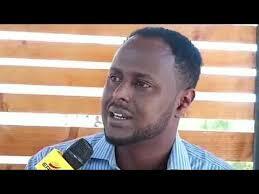 However, videos of the poem, currently available on all the social media clearly indicate that Mr. “Abees” poetry took the form of constructive criticism and he also mentioned the progressive steps taken by the Somaliland Police Force to address the issues of human rights, officer training and the general conduct of the force. Somaliland which uses the Civil Criminal Code inherited from the British jurisprudence upholds the right of “habeas corpus”, and the right of all individuals to be considered innocent until proven otherwise. The code also instructs the arresting officials use to warrants issued by the courts and to allow the accused the access to legal representations. At the present, Mr. Abdirahman Ibrahim Adam, “Abees”, has so far been denied all due process.